WATER companies here should examine how Disney movies make a box-office splash in order to attract investors. Ms Laura Shenkar, founder of water consulting firm The Artemis Project, urged companies to explain the technology simply, throw in a life story behind its creation and create a 'wow' moment. She was speaking to more than 30 entrepreneurs and researchers in the water industry on Saturday at a grooming session organised by national water agency PUB. The boot camp at WaterHub in Jurong East was held to give them a boost ahead of the Singapore International Water Week, which started yesterday. Some went on to make pitches to investors at the Water Week's TechXchange workshop yesterday that brought together innovators and investors. The boot camp participants were taught how to pitch products in less than three minutes, put together a business plan and protect their intellectual property. The session was helmed by Ms Shenkar and attended by Mr David Henderson, who has invested in 27 companies. Among the tips they shared: Keep the pitch short, simple and specific. 'Pretend you are talking to your grandmother,' said Ms Shenkar. 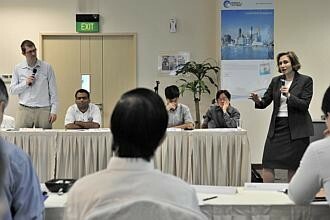 Most of the participants listened raptly, and gamely delivered three-minute 'elevator pitches' to Mr Henderson. After one claimed that his invention could increase rice crop yields and keep ships rust-free, Mr Henderson said the pitch lacked focus. 'A start-up company has limited resources. Choose a market and come up with a plan to dominate it,' he said. He added that entrepreneurs need to do research on potential investors. One participant spent half his time talking about water-scarcity dangers. 'Investors already know them. Tell us how your product can solve specific problems,' Mr Henderson advised. Others fared better, hitting his four targets. They described their invention, the target market and business opportunities, the value it could provide for customers and investors, and asked for a specific amount of money. Mr Henderson noted after the session that Singaporean entrepreneurs had become better at pitching since the first Water Week five years ago, but added that the boot camp could further polish skills. Ms Shenkar said the participants need to get used to talking about money and business. She said the water industry was conservative. While start-ups are common and encouraged in the communications and software fields, the same is not yet true in the water industry, she said. 'There is also no Google in the water industry yet,' she added. Mr Tan Lien Chiow, 59, chief executive of eight-month-old enZolar, which produces green engines, said the boot camp was a safe space for inexperienced entrepreneurs to refine their pitches. PUB said more than 200 people attended the TechXchange workshop yesterday, and it would follow up with the participants to check if any deals were made.